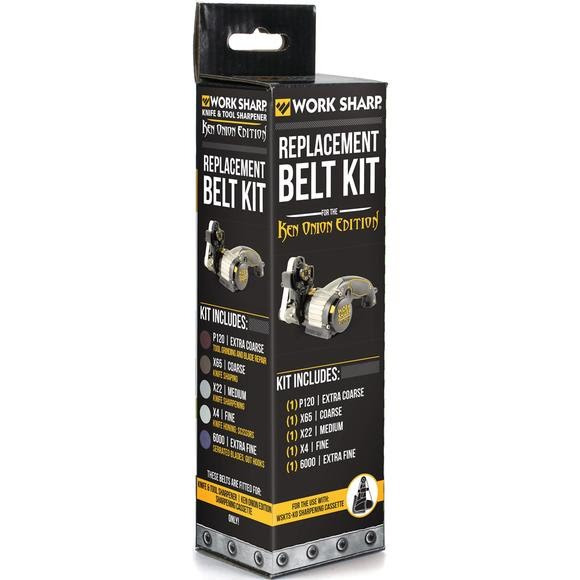 Replacement abrasive belt assortment for the Work Sharp Knife and Tool Sharpener - Ken Onion Edition (WSKTSKO) only. Not compatible with other Work Sharp tools. Replacement abrasive belt assortment for the Work Sharp Knife and Tool Sharpener - Ken Onion Edition (WSKTSKO) only. (1) P120 Extra Coarse Grit, 3/4" x 12"
(1) X65 Coarse Grit (P220 equivalent), 3/4" x 12"
(1) X22 Medium Grit (P1000 equivalent), 3/4" x 12"
(1) X4 Fine Grit (P3000 equivalent), 3/4" x 12"
(1) 6000 Extra Fine Grit, 1/2" x 12"